Image captured on 9 September 2018, by the VIIRS instrument, on board the joint NOAA/NASA Suomi-NPP satellite. 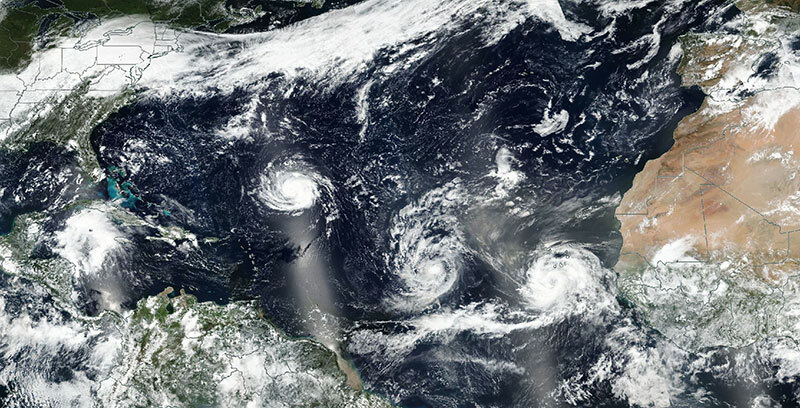 Image of Hurricane Florence, Tropical Storm Isaac and Hurricane Helene in the Atlantic Ocean (from left to right). This image was acquired on 9 September 2018 by the Visible Infrared Imaging Radiometer Suite (VIIRS) instrument, on board the joint NASA/NOAA Suomi National Polar-orbiting Partnership (Suomi-NPP) satellite. Visit Worldview to visualize near real-time data from NASA's Earth Observing System Data and Information System (EOSDIS).